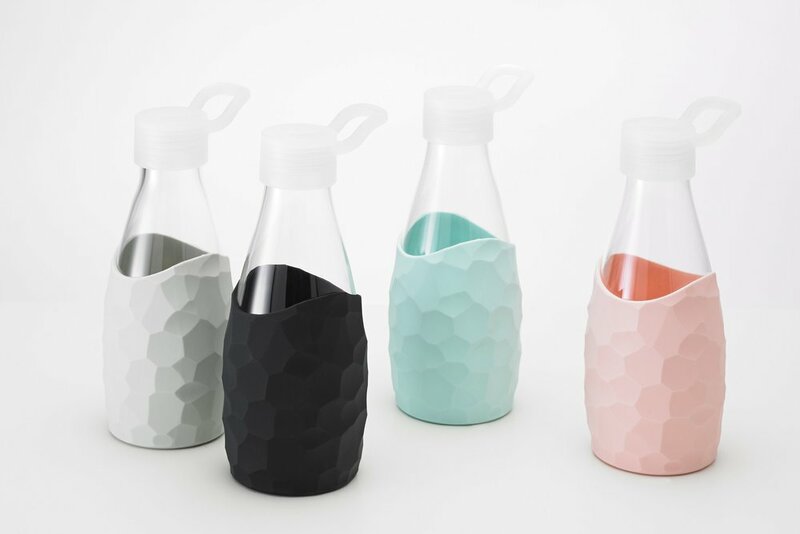 The Jordan&Judy Water Hydration Collection includes bottles that are made of borosilicate glass over disposable plastic. This is in addition to our engineers designing a container that has great looks, style and high function. Glass is an eco-friendly choice, made from natural and abundant materials. Though Borosilicate glass is much more expensive to manufacture than our competitors' inexpensive soda lime or recycled glass, Jordan&Judy can offer this superior product at prices competitive with those lesser quality products. Since borosilicate glass is BPA-free, BPS-free, lead-free and pthalate-free, your H2O will always taste clean and fresh. Our bottles are also thermo-shock resistant, which means they can hold hot coffee or freezing cold water without breaking. All of our bottles come with an all natural, easy-grip silicone (Si) sleeve that keeps the heat inside the bottle and won’t hurt your hands.